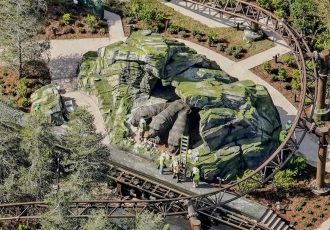 Even though it will be opening sometime this year, there has been very little official information released on the new roller coaster being built at The Wizarding World of Harry Potter inside of Universal’s Islands of Adventure. While I have previously published plenty of rumors and homemade track layouts, today I have what I believe to be an actual piece of concept art for the new attraction. 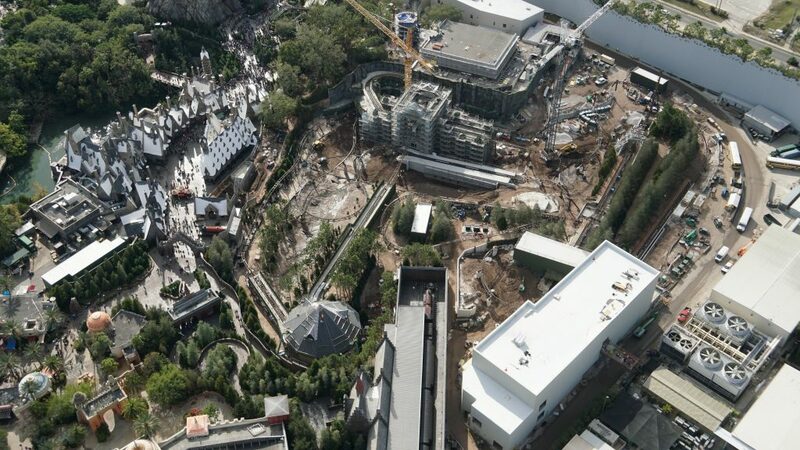 Provided to me by an anonymous source, the image appears to be a rendering of what the final ride and surrounding area will look like once completed. The concept matches what we’ve seen in aerial photos from @bioreconstruct. 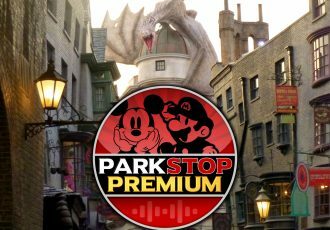 In addition to this leaked image, I have some new rumors to share, as well as what I believe the ride name will be, below. There have been a lot of rumored names floating around on the internet, especially in recent days. 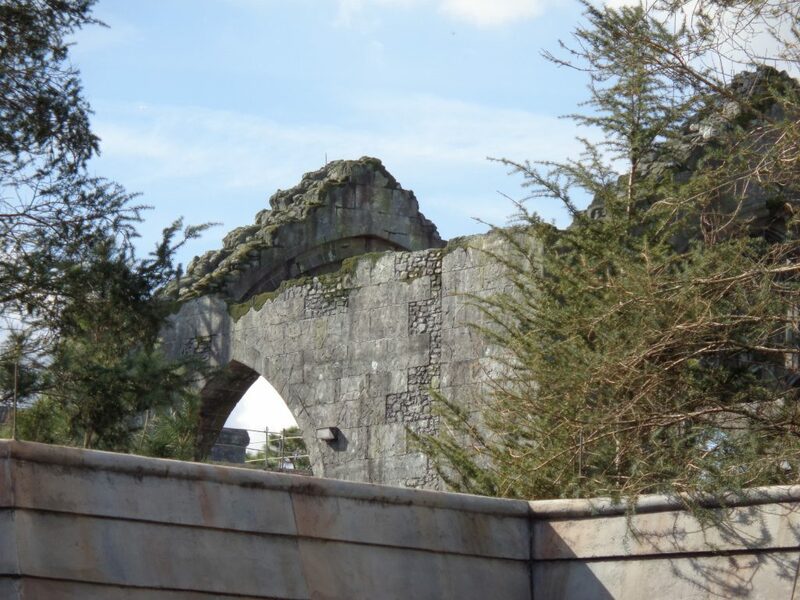 The one I believe to be the accurate name for the new coaster is “Hagrid’s Magical Creatures Motorbike Adventure.” However, there is now talk of that name being shortened to simply “Hagrid’s Magical Creatures.” (I would have preferred Hagrid’s Motorbike Adventure personally.) I’m reminded of last year when the new “Universal’s Cinematic Celebration” show lost its “Epic Cinema Under the Stars” subtitle at the last minute. With rumors of several different creatures from the Wizarding World, including ones we have yet to see on the other rides, it’s no surprise they would want to include the term “Magical Creatures” into the name somehow. Plus, the class that Hagrid teaches in the stories is called “Care of Magical Creatures.” And after all, Hagrid will be the star of this attraction. Not only will Hagrid be the star here, but his motorbike and sidecar will be as well. 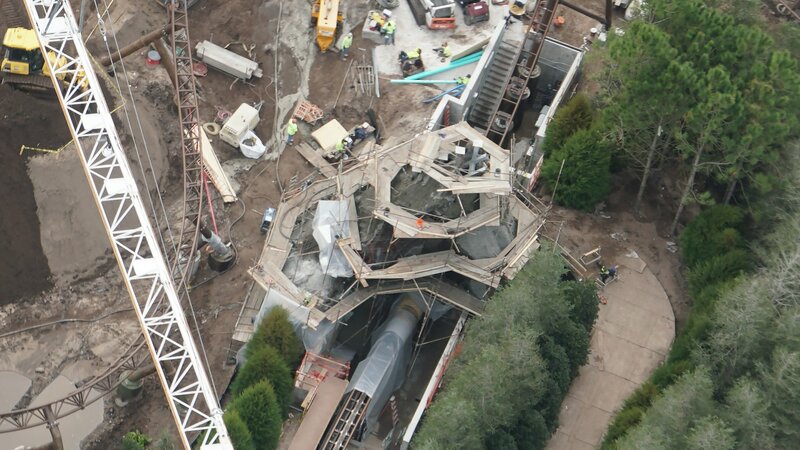 That’s because the coaster trains themselves will be modeled after his iconic motorbike. See my recent video (above) for more details on the coaster trains. Hagrid’s the star of the ride, we’re going to encounter Magical Creatures, and we’re going on a Motorbike Adventure. So, sure, that name makes sense all around. Getting back to the leaked concept art, one of the first things I took notice of, was just how beautiful this ride is going to look once that pond in the center is filled in! The theming for the ruins, the queue area, and the round structure is nearing a point where it looks just like this concept art, but it still be months before we’ll be able to see what it looks like with the water filled in. And, maybe I’m crazy, but are there some type of animals grazing on grass beside the water in the image? Maybe I’m imagining things, but that’s not something I’ve heard rumored for the ride before. Another interesting area that’s worth pointing out is the entrance to the tall spike. It appears to have a rockwork cave appearance, but the spike itself is only blocked by trees. This spike is a point of the ride where our coaster train will travel up several stories, only to fall back down backwards immediately after climbing. Early rumors had the spike enclosed in a building, but recently it has come to my attention that this structure has been cut from the plans. No word yet on whether the cut was for monetary or other reasons. It does appear to me, at least from this concept art anyway, that the structure was probably not in the plans for awhile now. In addition to the cave, there is also a section of rockwork in the image where we have heard Fluffy the 3-headed dog will be hiding. 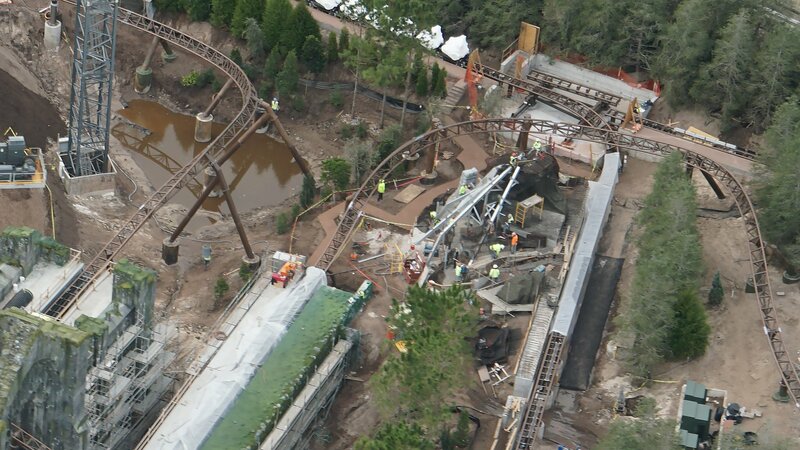 We can see that rockwork structure taking shape in aerial photos now. 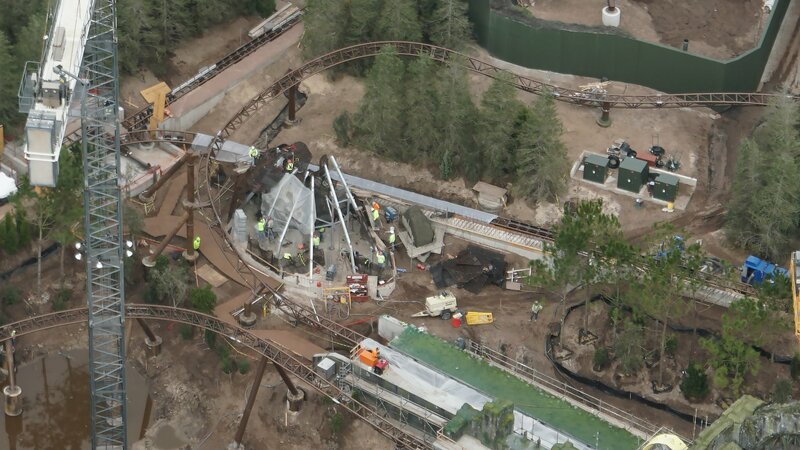 I do have to wonder if that unique twisted tree trunk structure seen in the art will make its way onto the ride as well, as that is not something we’ve seen take shape yet. If it does, it would be located around the rotating track into the show building at the back of the site. 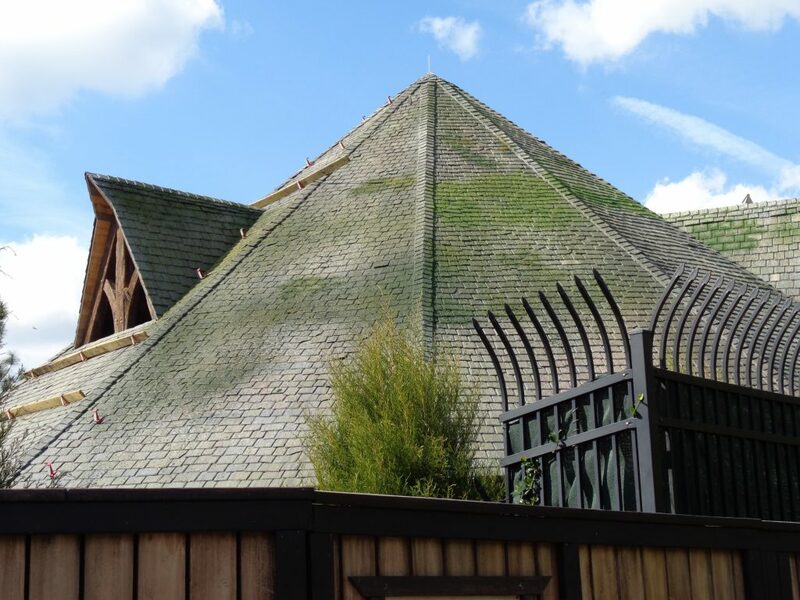 The concept art also shows off how nearly everything located outside at this attraction is absolutely covered in green moss. Lately, construction progress at the site has certainly shown a great deal of moss and lichen theming being added. Both the mysterious ruins and the round structure have received some green in recent weeks. What cannot be known from this particular concept art is what will be found inside of the structures themselves. For a clue on what show scenes may be found on the ride check out my last article. 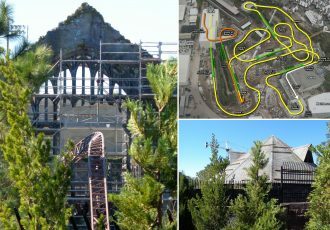 It contains a scene by scene breakdown of the entire ride as well as an updated track layout graphic. One thing I have not spoken about yet though, is what may be awaiting us inside of the queue for this ride. 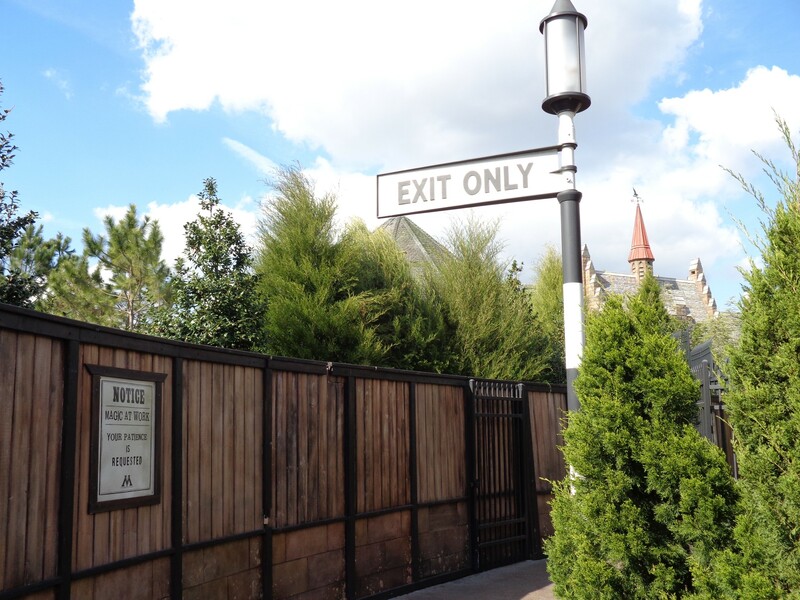 Some rumors have us entering Hogwarts Castle, and visiting locations that have not yet been explored in the queue for Harry Potter and the Forbidden Journey. With all the hidden tunnels and passageways of Hogwarts, they really can do whatever they want here. 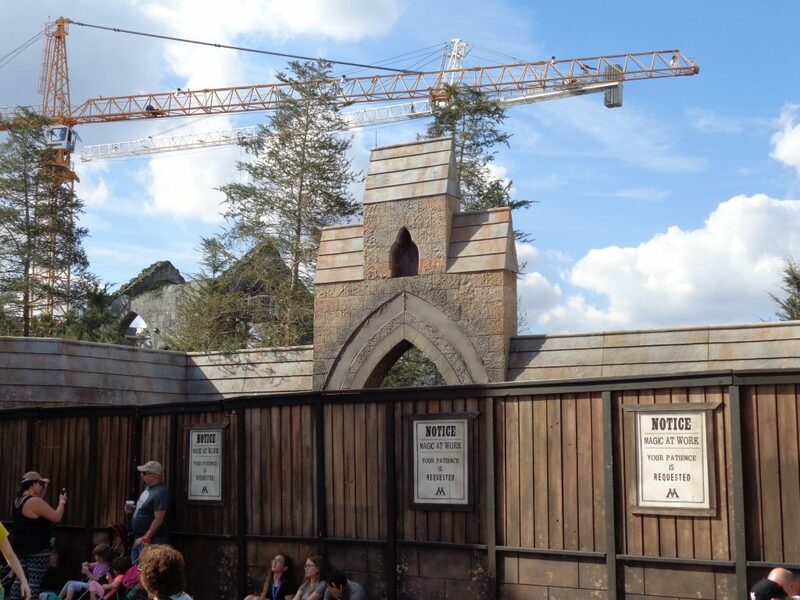 Fingers crossed this rumor is true, but one of the locations inside the queue may be the Great Hall, and another would be the Hogwarts kitchen. This would be an amazing use of space, and a great way to really flesh out the Wizarding World if true. Here’s hoping there’s house elves working in the kitchen! They’re something we have not yet seen in the lands, (other than a statue in Diagon Alley of course). 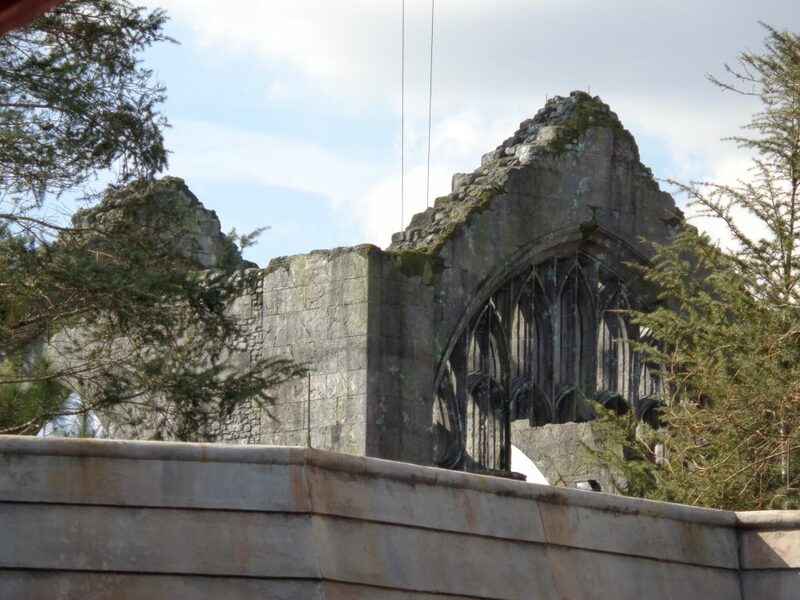 Of course, just because the inside of the queue may take place at Hogwarts, does not mean those mysterious ruins outside are a part of Hogwarts. I still believe those to be a new location set in the forest near the castle grounds, and that they will be original to this ride. This ride may very well be one of the greatest theme park attractions that Universal has ever created. It seems to have a little bit of everything: roller coaster elements, high speed launches, dark ride show scenes, animatronic characters, and absolutely epic theming. In recent months we’ve seen more and more trees planted in and around the attraction. Sure this makes it a little harder to take photos of the ride, but it’s going to make the ride experience so much better. Just look at that concept art to get an idea of how many trees will be planted by the time it opens! For more information on what we may see on the ride, check out my original video from last year. To see the updated track layout and latest scene rumors, see my recent article. We’re still awaiting more official details from Universal, which Pottermore said would be coming early this year. 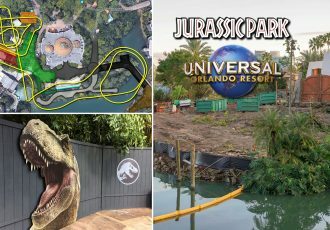 Remember, the piece of concept art above, the rumored name, and rumored queue scenes have all not been confirmed by Universal. The new coaster is rumored to be opening this summer. For help booking your next trip to Universal Orlando request your free quote from Elizabeth at Destinations in Florida today! She’ll help you plan the perfect vacation with the best rates on ticket packages and on-site hotels, and her services are totally FREE to you. Side note on the rumor mill. 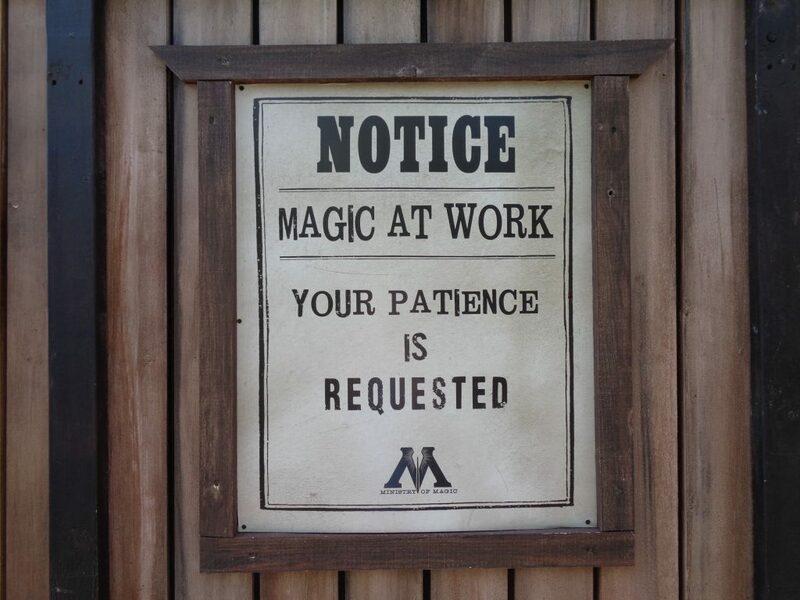 I heard from an employee who will remain anonymous, that It May be in the works for HP to have its own park entirely. So it will be really cool if that rumor turns out to be true and how they make that all work with the current attractions. That is pretty farfetched, at least in Orlando. Fantastic Worlds, Universals 3rd full dry park is already rumored to have HP represented with Fantastic Beasts (around 2023). 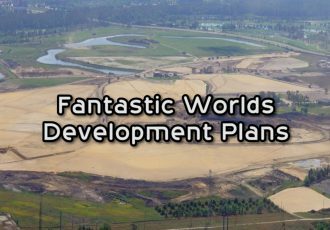 Would be silly to have an entire forth park in Orlando dedicated to HP, which would have to be projected for 2030 or beyond. Maybe for London or something (still far fetched). 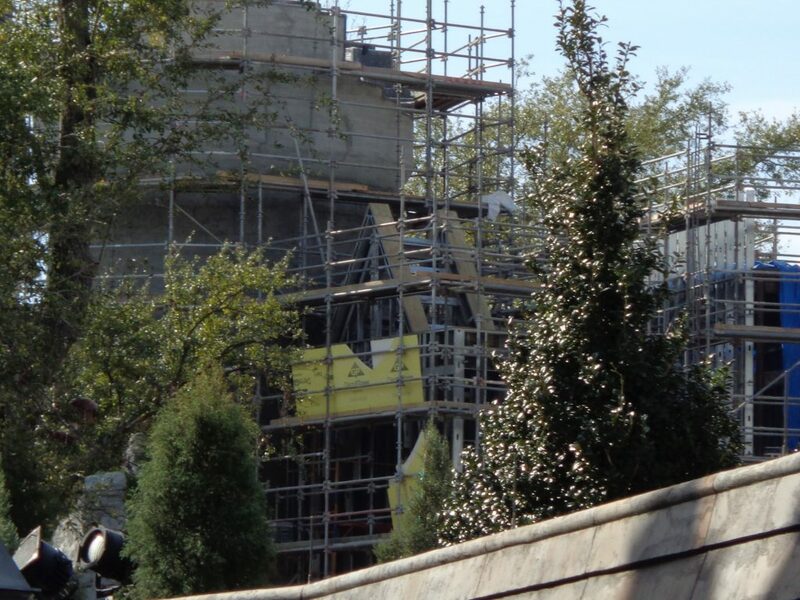 Once the new coaster opens, will universal change the outside of the wizarding world shopping bags? I hate them. They’re horrible!! !